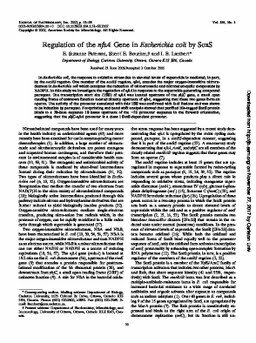 In Escherichia coli, the response to oxidative stress due to elevated levels of superoxide is mediated, in part, by the soxRS regulon. One member of the soxRS regulon, nfsA, encodes the major oxygen-insensitive nitroreductase in Escherichia coli which catalyzes the reduction of nitroaromatic and nitroheterocyclic compounds by NADPH. In this study we investigate the regulation of nfsA in response to the superoxide generating compound paraquat. The transcription start site (TSS) of nfsA was located upstream of the ybjC gene, a small open reading frame of unknown function located directly upstream of nfsA, suggesting that these two genes form an operon. The activity of the promoter associated with this TSS was confirmed with lacZ fusions and was shown to be inducible by paraquat. Footprinting and band shift analysis showed that purified His-tagged SoxS protein binds to a 20-base sequence 10 bases upstream of the -35 promoter sequence in the forward orientation, suggesting that the ybjC-nfsA promoter is a class I SoxS-dependent promoter.